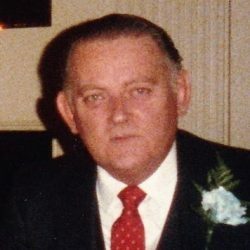 James T. Canty, 83, of Holliston, passed away Friday, January 25, 2019 at the Metrowest Medical Center in Framingham. Born in Somerville, he was the son of the late Mary (McCarthy) and Cornelius Canty. He was the husband of 55 years to Lorraine (Gargan) Canty of Holliston. James was drafted into the Army and served in Germany. He was a retired Colonel of the Massachusetts State Police. After retirement, he went on to work in the banking industry for 10 years. James was a big family man and took pleasure in spending time with the ones he loved. Besides his wife, he is survived by 5 children, Deborah Canty and her husband, Michael Howlett of Moultonborough, NH, James Canty and his wife, Rebecca of Hopkinton, Cheryl Obid and her husband, Sano of Holliston, Richard Canty and his wife, Amy of Natick, and Kevin Canty of Holliston. He also leaves behind his sister, Mary Canty of Brighton, and 5 grandchildren, Zachary, Kyle, Jake, Marie, and Katherine. He is predeceased by two brothers, Frank and Paul Canty and his grandson, Brad Canty.